The difference is that in everything we do, we try to echo the quality of our wine and this eventually becomes our marketing angle. We do it small, we do it well and we do it so differently to anybody else. The end result is rare and unique. Raats Family Wines is a boutique winery situated in the Polkadraai Hills area of Stellenbosch, South Africa. The Estate was established in the year 2000 and is considered a specialist in crafting world class and truly distinct wines from Chenin Blanc and Cabernet Franc from older vineyards. It is their mission to consistently produce Chenin Blanc and Cabernet Franc of outstanding quality from South Africa and to establish these wines as international benchmarks. Raats Family Wines have already earned a stellar reputation internationally as a New World leader in the production of these varietals and regularly receive positive write-ups by esteemed wine reviewers such as Olly Smith, Matthew Jukes, Tim Atkins, James Molesworth, Neil Martin and Jancis Robinson in definitive publications such as Decanter, Wine Spectator, Wine Advocate, Wine Enthusiast, The Observer, Daily Mail and New York Times. 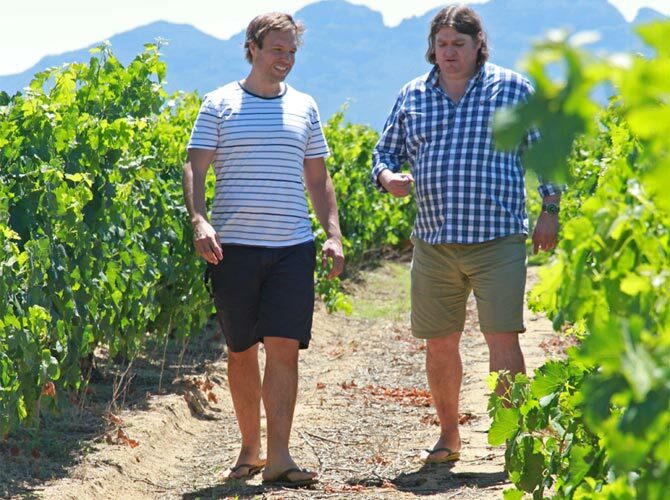 Proprietor and award-winning winemaker Bruwer Raats has received international and local acclaim during his highly acclaimed career as cellar master and viticulturist par excellence. Produces an upper scale product of high and consistent quality which they have managed to maintain throughout its range of wines. Quality driven and have set high standards for themselves to ensure the overall quality of the product meets with consumer satisfaction. Produce wine that represents SA Terrior and therefore tastes completely different from any other country in the world. The only Cabernet Franc specialist in South Africa. Family run operation which is hands on and do everything themselves. Maintains complete control of viticulture at these sites, located at an average of 250m above sea level in the prime Bottelary Hills, Simonsberg, Helderberg and Blaauwklippen areas of Stellenbosch. Soil specific and only sources Chenin Blanc and Cabernet Franc from several extremely low-yielding old vine parcels characterised by complex soils of table mountain sandstone and decomposed dolomite granite. Produces just over 10 000 cases of 12 (120 000 bottles or 90 000 litres) of wine per annum and harvests grapes from about 25ha in total. All the vines are located in Stellenbosch region with about 80% of plantings being Chenin Blanc and only 20% Cabernet Franc. Philosophy: Leave the soil in a better condition than what you found it in. This goal underlies all our actions and decisions. The wine shows a very complex, perfumy nose of liquorice, spice, aniseed, fennel and tarragon with a dark berry fruit character. Blackberries, redcurrant, cherry and a cedar wood spiciness follow through onto a very juicy mid-palate. The long, fine finish offers notes of cranberry, blueberry, cinnamon and dark chocolate. It is Cabernet Franc at its very best: lithe, supple and elegant. The 2013 gemstone is very complex; with subtle dark berry fruit on the nose and all the perfume and violets one would expect from 85% Cabernet Franc. The palate surprises with its darkness of fruit: blue and blackberries, blackcurrant, even bramble, intertwined with hints of tobacco and the darkest of chocolate. Complex and structured, it will be difficult to tire of this wine. “This wine should keep you busy.” – Bruwer Raats and Gavin Bruwer. The nose promises mulberries and plummy fruitiness. Dark berry fruit and a minty herbaceousness linger on the palate. The wine is elegant, showing great purity of fruit and is extremely moreish, with a hint of wet-stone minerality. 95% Cabernet Franc, 5% Malbec. This wine epitomises the understated elegance of Chenin Blanc. Its restrained, yet complex, nose offers quince, ripe pear, orange blossoms, nettles and spice. On the palate the wine shows granadilla, pineapple and lemongrass and the cloves, nutmeg and ginger of the nose follow through against a backdrop of vibrant acidity, ending with a long spicy, limey note. The wine’s beauty lies in its lightness of touch and in the elegant way its complexity is revealed. The wine has a distinctive yellow apple and pineapple core, alongside notes of green melon and limes. The wine is thus bursting with fresh fruit flavours. The wine ends with zesty citrus flavours, and has a long mineral finish. The Raats Original Chenin Blanc 2013 is a classic example of a Chenin Blanc of older vines, grown in very specific soil types. Now in its 13th year of production the consistency in quality is unquestionable. Scored 91-93 points by Neal Martin from The Wine Advocate (0ct 2014). Rated 4 Stars, 2015 John Platter (November 2014). Scored 91 points by Tim Atkin (July 2014).